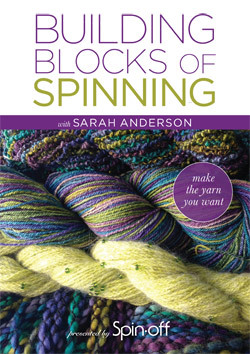 Learn the basics and beyond of spinning the yarn you want with this 237-minute comprehensive workshop with Sarah Anderson. Spin the Yarn You Want! Every technique and concept is explained clearly and simply in Sarah’s inimitable, enthusiastic style with video that lets you see all the action in amazing detail. Topics are presented in easy-to-find chapters so you can reference them again and again over your spinning career. Everything you need is here! Join Sarah on a journey of fiber discovery and creativity that will enrich your spinning for years to come with this 237-minute spinning workshop! available on a 2-disc DVD set or instantly as a video download in standard or high definition.